For my gr 6 social class, which focuses on democracy in historical settings and in modern Alberta, I created an ARG. Students learn that I am a sleeper agent for a futuristic sort of time police, assigned to watch them and assess their readiness to become agents. Their activation is accelerated when a rogue agent named Socrates decides to destroy democracy and take over the world. Students can choose to complete various assignments in social studies that either aid Socrates or the agency in defeating him. Along the way there are little clues and Easter eggs to discover, such as the ability to "hack" an agency email and discover one of Socrates' co conspirators. Depending on whether more students aid Socrates or the agency the game ends with either a news broadcast sent back in time (courtesy of my husband) announcing Socrates' arrest or a rather cold message from Socrates thanking the students for their help and informing them that they are no longer necessary in his new world order. I am in the middle of developing, planning and kicking off my "urban archaeology" game/story. I did post it in another forum in Week 4, but it was late in the week, here is the link Urban Archaeology Field Work. Right now I would say it is in the proto-type or maybe "alpha testing" phase. The story is that things we have now or have disposed of in our culture are in fact "artifacts" and I want to have my students be archaeologists/anthropologists exploring and identifying items that have connections with time and space. They have studied a section on applied anthropology, on ethnography (field work) and have seen a media presentation on "Garbology" [looking through garbage dumps] and since I don't want to take them to the dump, we are going to an auction. We are working to create the past from what is discarded for sale. Many times we will find boxes of one families stuff left over from an estate auction and it includes mementos, photo albums, clothes, jewelry, everything. Then it isn't our story any more it is THEIR story and we try to recreate the life of that individual. We also just look for unique objects while we are doing that. I think I could create an Interactive Fiction for this assignment. I am open to suggestions. This is the first time I have taken all my classes to an auction in several years, and the Augmented Reality and Class Competition is new, so are the awards. . . I am interested in whether more show up... if there is kind of a pressure to try to win the class prize. I love Behavior Modification. That all sounds really cool. I like the idea of artifacts and transforming stories. You don't need to find this site to finish the game, but it's an "easter egg" providing a bit of insight into Socrates' motivations. It is the not-to-distant future and America stands on the brink of a second Vietnam War. A secret contingent of defense officials and military leaders are trying to create a new secret weapon: an elite force of writers who write games that can prevent war by creating empathy for the enemy by allowing the player to walk in their shoes. The plot will involve students first going through a special ops writer's boot camp, then gathering intelligence, then creating their games. During the story, there will be a security breach that makes it increasingly harder for students to access information and complete their assignments. If students wish to and are curious enough and work hard enough, they can solve the mystery of the source of and reason for the security breach, while also avoiding another Vietnam War. It's very early in conception, so it's still rough around the edges and only half-formed, so any ideas or feedback is very welcome. I like the idea of the Vietnam War. The only suggestion I could offer is that, to maintain the suspension of disbelief (the "this is not a game" aspect of an ARG -- if that is that's what you're trying to do!) you may want to set it in the present as if this is actuallyl happening rather than the near future. Please excuse my tping today and my last few posts btw. I burned my finger quite badly on a high temp glue gun and the blister is interfering with my ability to type. So, this is a crazy little side-note...the other day while I was doing housework, I began to wonder what future archaeologists will make of our vacuum cleaner bags. Over centuries will they harden into rocks and become like the gastroliths found in dinosaur bellies? How cool would that be? Mostly just dust/rock, but the occasional treasure...a penny, a game piece, a marble, even perhaps a piece of jewelry, who knows? @Grasshopper98, I really like what you're doing with your classes. I think you might even be able to weave a real-life box of auctioned identity into an ARG for which you have provided the narrative context. The students further develop the narrative as they reconstruct the story of the person whose belongings they find at the auction. Very avant garde teaching, imho. Yes, I am thinking of buying some boxes at the auction that tell families stories and then give them out to the class for group re-constuction. There a couple of good articles on what archaeologists in the future might think of our cultures. This is one that I used to have student read and then comment on the behavior of the anthropologist/archaeologist. Read this and tell me what you think of the cultural norms and of the way the anthropologist sees them, is he ethnocentric? This was published in the American Anthroplogist. .. Body Rituals Among the Nacirema This book, only 196 pages is also a good read, I have thought about assigning it, but with the cost of books I don't, Motel of the Mysteries Both of these talk about backwards time travel, the future to now. I think with the use of the auction and garage sales and antiques, it is me bringing my knowledge and what I actually have fun doing in real life. I am just starting to really weave it into my class structures. I have some lithics (stone tools, real ones from 10, 000 years ago) and I bring them into the class and let them hold them and see how they fit their hands and think of uses. I show them a real Folsom Point and they can feel the drainage area to let the blood of the animal flow out the arrow shaft hole, it was a massive shift in technology. Love everyone's ideas here! I feel way behind the 8ball here in that I have so many ideas but am still in the choosing what I want to do stage and not quite sure how to get there. All of the resources and ideas from this MOOC we have been great. Maybe too great lol. I know I don't want to go no tech. I am just not sure how much I want tech I want to use or how little or what format I want to use either. 1. Library orientation which would have to be an in person game using QR codes or Aurasma or something similar. 2. A research skills learning game which could be totally online (using databases, online catalog, search engines, etc) or a combination of in person (using reference books etc) and online. 3. Primary sources which could be online or in person. My biggest block I guess is story. How do I present these things as story because yes they are important but not an issue like war, poverty , etc.. The primary sources coud be used for any issue which could make it story. I am attending an NEH workshop in Deerfield, MA this summer that may help me with that ( see living on the edge of empire . The library orientation could be a mystery. The online research could be anything . One way to look at it would be: How have others done this? How do we see characters in games and movies using research? I know it's a well known example, but there's the Carmen Sandiego series. You're given a clue and a fill-in-the-blank answer (in the game, typically either a location or a time period). It's basically you getting closer and closer to catching Carmen Sandiego (or one of her lackeys). Perhaps something like this for the research skills game would work? And, as always, the tech should be an extension of the game and not a reason for the game itself. I think if you were going to do something tech-y in the library, QR codes would probably work better. I think that Aurasama only works with iOS whereas QR codes work with almost any mobile platform. I haven't done much with this iteration of the mooc, because I'm a librarian and have struggled unsuccessfully with the idea of a library skills game for years. I'll be very curious to see what suggestions people have for it. My suggestion would be to keep it simple. Don't try to teach everything about online research - think about one small module and develop that. Once you think you have a topic, then think about what small sliver of that topic you could develop for your first game module. Some possibilities might be: the difference between a basic Google search and using Google Scholar, identifying a website that's a valid source of information, using Google Scholar to explore a topic, understanding the difference between scholarly journals and popular magazines, understanding the differences between a general encyclopedia like Wikipedia or Britannica and a specialized one like those included in Gale Online Research Library. Using one particular database can work, but it can also be a problem, because database interfaces change so frequently that anything describing a specific interface will be obsolete very soon. Your idea about exploring primary sources might work very well. You could give students a list of events and ask them to explore the web and locate primary sources. Would need some scaffolding about evaluating various types of websites and identifying a primary source. Now you've got me thinking about this again. I'll be very curious to see what you end up doing - perhaps it will inspire me to get back into trying my hand at library skills games. I will keep you posted on what I come up with. Any other insights you ave will be welcomed . I did think about going the Carmen Sandiego route. Just wanted to try and come up with something different. Still thinking lol. Our middle school is 1:1 iPads so we will will have no problem with the ios of Aurasma. My only problem is still not having an educator account to be able to create public shareable auras that I design . If I can't get one, it is a moot point. I am thinking of doing the orientation game using the QR codes and a combination scavenger hunt and mystery. I also would like to work out the primary sources game idea. I could set that up as a mystery to be solved by following a set of primary sources. It could start out with a briefing file then follow various primary source clues through to the conclusion. As for the search skills game I think that will require much more work and I may put that in hold to work on over the summer. I just attended a regional Classical conference and came upon a fantastic paper at a panel. C. McKinney is a mathematics professor, but studied and teaches Greek. The Classics department was looking for a math course that students could take instead of Calculus, so he created Readings in Ancient Greek Mathematics. Now, this is very much a math course on Euclid's proofs, but he found out that the students began with having challenges understanding the Greek, and then once they mastered Euclids' pattern of language, the latter part of the course presented challenges in the math itself. apples does Quintus have now? Now that might not look intriguing, but there's actually quite a bit of linguistic features involved in responding to and/or translating that problem. The result? A little puzzle to solve. Yes, there is an obvious answer, but the challenge is in the use of the Latin. Instead of there just being a narrative, I could incorporate perceivable answers that most 9th graders could figure out. So, my original story involved going back in time to solve _____. Well, I can't think of anything more relevant to us in the US than the prospects of Financial ruin. 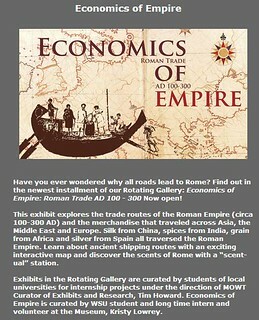 Why not travel back in time and take part in the Roman economic trade system, gaining "lost skills" that would help balance the US budget? In this sense, my game may end up looking like a Sim City/Age of Empires type in which allocation of resources is the big mechanic. Perhaps Sam could help with some ideas on this one. Riven, I added a whole bunch of links to some interesting articles about gaming in the library to the Diigo group. Check them out. MagisterMrP - Great idea for a game. Also like the ideas about playing around with language and logic in latin. Here's a link to a similar game Ancient Rome Game . There's a really good blog post on "Buffy the Vampire Slayer and Research as a Public Good." This might be a good place to get some ideas for building a narrative around research and designing a research-based game. Awesome example! It's a little frustrating when I'm watching a movie and watch the main character plop down at a search engine, do a search for the bad guy, and find everything they want on the first page. Thank you for sharing this! I have had some success and enjoyment with my college class with this game even if it is more K-12. It is a good introduction in the Chicano/a Studies class as we start that class discussion the pre-colonial history of Mexico an MesoAmerica, you learn, you explore, and you can play the game or be a spectator, you score points by answering questions about the game. In real life, this game was a matter of life and death, the participants didn't get to re-spawn.